Catwalk to Runway | Category Archive | Spain-Viva Espana! You are here: Home » Spain-Viva Espana! 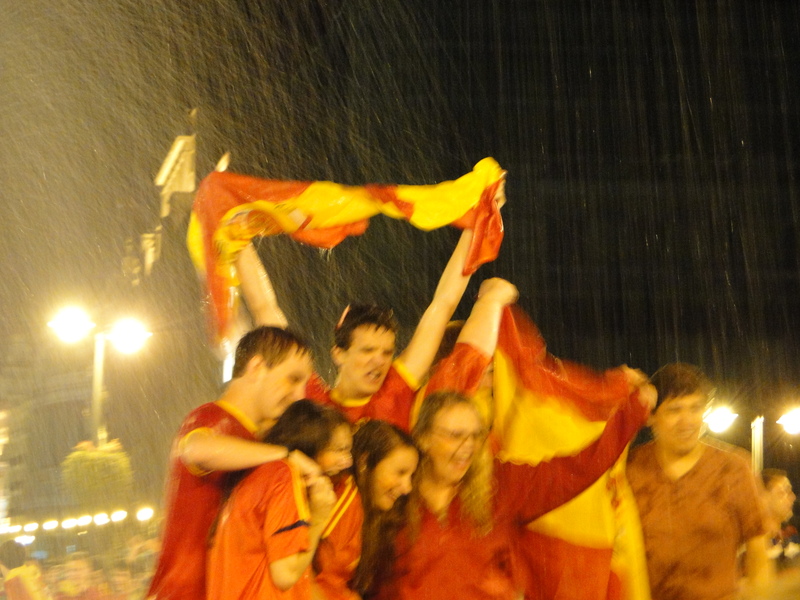 The energy on the streets of Madrid during the Euro Cup victory celebrations was palpable! With Spain outlasting Italy 4-0, loyalists, tourists and non-sporting voyeurs took to the streets to scream, dance, shout, hug, photograph and video the reaction of hundreds of celebrating fans. It was fantastic with people getting into two tier fountains, splashing rain on everyone, blowing horns, and helping even more people into the fountains of Madrid. At the traffic lights, people counted down till the cars were signalled to stop and rushed the intersection with organized chaos and more jumping for joy. When the traffic light changed, most people ran back to the sidewalks to clear the way for cars to go through. But the frenzy to express heartfelt happiness of Spaniards gave way to reason and traffic soon could not overcome the crowds who were too joyous care. People piled into the streets and cars were slowed and blocked from moving. Some cars tried to U-turn to avoid the chaos from every direction. Meanwhile, in the fountains and squares people had dressed up with flag sarongs, flag capes, red and yellow tutus, wigs, facepaint and horns. Many tourists pumped up the noise all night long! It was a privilege to be in Madrid for this magical moment! Tourists from all over the world, Spaniards, and all cultures could be seen in the streets of all ages truly enjoying each other as if they were one! We stayed in the streets for a few hours after the game to join in the festivities. Being stationed in a downtown hotel, there was no way we would have been able to sleep a wink. I worked my flight the next day sleep-deprived, but I wouldn’t have had it any other way! Viva Espana! Congratulations!